44 years – 22 matches. 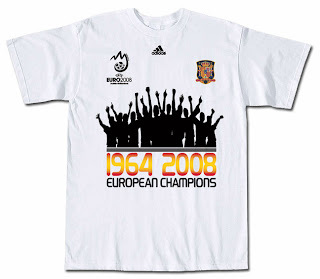 The Spanish National Fútbol Team waited 44 years to win a major trophy, winning the Euro 2008 on Sunday, June 29th, also reaching an amazing 22nd match unbeaten. At times it wasn’t as pretty as their win against Russia, and they played the counter attack for much of the second half, but they never really looked to lose control, instead kept the ball for most of the match, and gave Casillas little tension at goal. There were several more chances, like Torres’s and Sergio Ramos’s headers which hit the post, and the cross that Senna almost had. The moment Casillas lifted the trophy was profound, as a nation, long-suffering so many dashed expectations, finally rejoiced with their team. I will soon be donning that awesome t-shirt up there, which greatly depicts Spain’s few but proud footballing achievements.